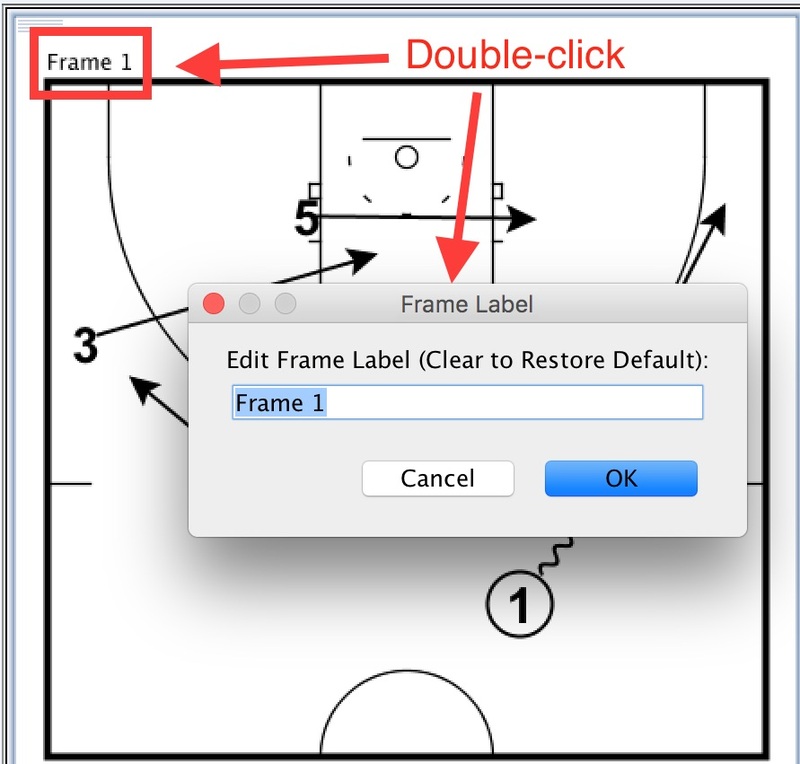 When diagramming a play in the Draw tab, you can edit the Frame Label of the play, which will by default be listed as "Frame 1", "Frame 2", etc., by double-clicking on the current Frame Label. When you add a custom Frame Label to a play and then add that play to a playbook, this will affect the way that your play appears in the playbook. Within the Playbook Settings menu, you have the option to set the Title or Subtitle of the play as the Play Name. When using the default Frame Labels (Frame 1, Frame 2), setting Play Name and Frame Label as the Play Title and Subtitles will appear as below. When you set a custom Frame Label, the Frame Label will override the Play Name for that frame only. However, if you have set the Page Subtitle setting to "Play Name", then this custom Frame Label will also be used for the Page Subtitle. 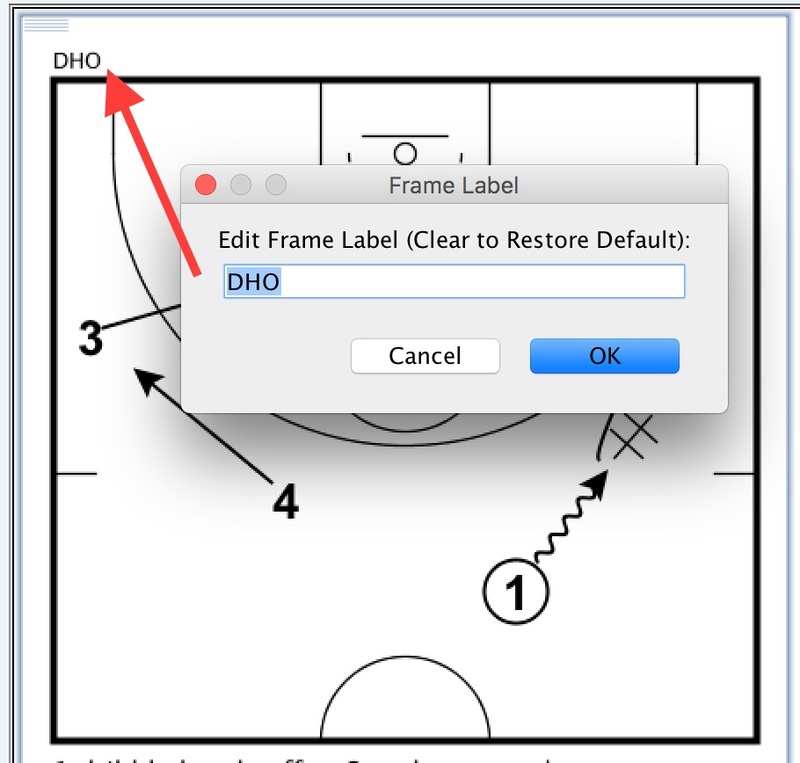 If you do not want the custom Frame Label to overwrite the Play Name, you can deactivate this option. Doing so will require you to have Advanced Print Settings activated, however. Advanced Print Settings can be turned on by clicking the File menu from the top menu bar and selecting Program Settings. Select the Printing tab from the top of the Program Settings menu, and at the bottom of this menu, choose the option for "View Print Settings in 'Advanced' Mode". Click OK at the bottom to finalize your changes. Now when you open the Playbook Settings menu again, you have the option to deactivate Use Custom Label as Play Name, which will prevent the Frame Label from overriding the Play Name.